A Minimally-invasive Blood-derived Biomarker of Oligodendrocyte Cell-loss in Multiple Sclerosis. Olsen JA, Kenna LA, Tipon RC, Spelios MG, Stecker MM, Akirav EM. Multiple sclerosis (MS) is a neurodegenerative disease of the central nervous system (CNS). Minimally invasive biomarkers of MS are required for disease diagnosis and treatment. Differentially methylated circulating-free DNA (cfDNA) is a useful biomarker for disease diagnosis and prognosis, and may offer to be a viable approach for understanding MS. Here, methylation-specific primers and quantitative real-time PCR were used to study methylation patterns of the myelin oligodendrocyte glycoprotein (MOG) gene, which is expressed primarily in myelin-producing oligodendrocytes (ODCs). MOG-DNA was demethylated in O4+ ODCs in mice and in DNA from human oligodendrocyte precursor cells (OPCs) when compared with other cell types. In the cuprizone-fed mouse model of demyelination, ODC derived demethylated MOG cfDNA was increased in serum and was associated with tissue-wide demyelination, demonstrating the utility of demethylated MOG cfDNA as a biomarker of ODC death. Collected sera from patients with active (symptomatic) relapsing-remitting MS (RRMS) demonstrated a higher signature of demethylated MOG cfDNA when compared with patients with inactive disease and healthy controls. Taken together, these results offer a minimally invasive approach to measuring ODC death in the blood of MS patients that may be used to monitor disease progression. MS is characterised by demyelination (i.e. loss of myelin) regardless of whether its the initial episode, relapsing-remitting, or primary progressive MS. The most sensitive way to assess this is within the cerebrospinal fluid, measuring myelin basic protein (MBP); however, this requires a lumbar puncture and cannot be measured in the blood. Here the authors think that they may have a solution for this by studying tissue-specific DNA methylation patterns in the blood. In this case myelin oligodendroctye protein [MOG] expressed by oligodendrocyte cells [ODCs] which forms myelin in the brain. DNA methylation is the process by which methyl groups are added to DNA, regulating the rate of gene expression. Using methylation patterns, you can locate the cell from which that specific DNA originated from. The measurement of ODC-derived MOG DNA in blood can be used as a marker of demyelination. Cuprizone treatment in mice results in demyelination, and consequently a rise in OCD-derived DNA in the blood. Similarly in RRMS OCD-derived MOG DNA correlates with disease activity, and not surprisingly with either age at diagnosis or disease duration (see figure below). Figure: Elevated levels of demethylated MOG DNA in RRMS. A. 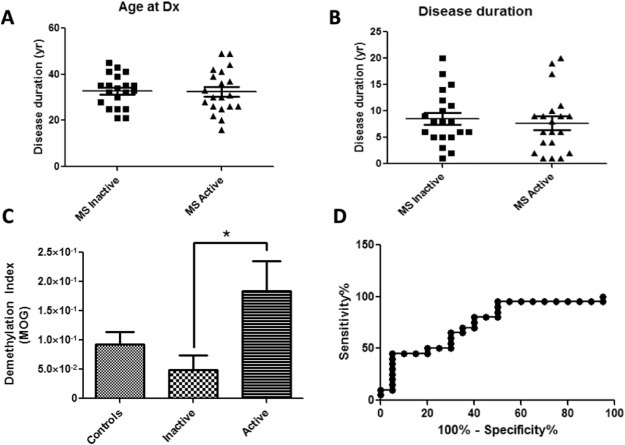 Age at diagnosis of RRMS for active and inactive groups. B. Duration of disease of RRMS for active and inactive groups. C. Demethylation index (MOG) from sera of non MS, and inactive and active RRMS. D. ROC analysis of sensitivity and specificity of the test. How to translate from the bench to the bedside. My experience from doing this with neurofilament testing is that 1) Resources (money but also man power and good will of other members of staff who do the basic stuff like get the sample, process it etc.) 2) validation of the test so that the results are robust – this is no longer simply about one off research but clinical testing, where the mantra is quality, quality and more quality 3) setting up the test so that the it supersedes your inventive step, acceptance by other equally minded clinicians so that it lasts or is overtaken by better quality tests. It's very important that tests such as this are picked up by clinician scientists who see the potential beyond what is written on paper. The ROC curve is hard to read, and I don't have access to the article. What's the AUC for the test? AUC 0.7475 (95% CI 0.59-0.9); the sample size is small (40 in the MS, 20 in the control) which may explain the huge steps. ResearchSpeak: Do my MS lesions have an iron halo?